You are at:Home»English»Columnists»OCHAZUKE: Celebrating a Century! As a college student, Kinoshita dreamed of majoring in aeronautical engineering but when he was barred from even participating in a college field trip to an aerospace company, he found another way to fly into space. He joined Hollywood. But his Hollywood career came about after he spent time dur­ing World War II at the Poston (Colorado River) War Relocation Authority camp in Arizona. And Hollywood didn’t welcome Kinoshita with open arms. Only after putting in a lot of hard work and long hours was he able to sidle his way through a “side door” and finally get recognized for his talents. 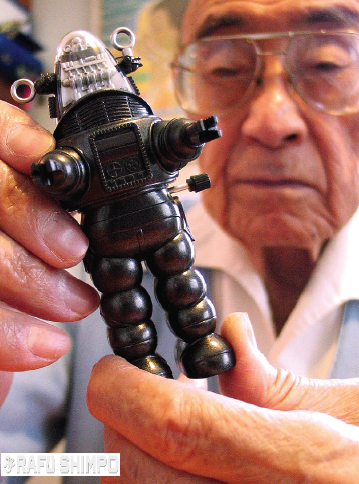 By the time Kinoshita retired, he had more than 1,200 tele­vision and motion picture credits. Kinoshita’s robotic creations have also appeared in “The Twilight Zone,” “Columbo,” “The Addams Family,” “The Man from U.N.C.L.E.,” “The Love Boat,” “Mork and Mindy” and “Gremlins,” to name just a few. Mario Reyes is photo editor of The Rafu Shimpo. Ochazuke is a staff-written column. Opinions expressed are not necessarily those of The Rafu Shimpo.